A strange and dark movie that has comedic elements, but is just as much a mystery as anything else. The Hospital was written by patty Chayefsky. He’s the guy who wrote network, the iconic seventies staple movie of mass entertainment, media, and the anger of society, out of patience with the stupidity of the masses. 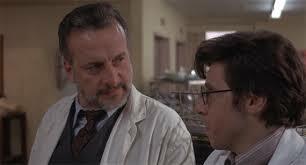 All of this is noteworthy, because the hospital is in many ways a similar movie. Like, network, it’s a black comedy about how ridiculous things can be in a work environment, and how affairs and strange occurrences can pop up out of nowhere. This is far from slapstick. It is dark as hell, and the movie is fused with the same angered spirit as network was. While it’s not nearly as effective here, it is still a pretty creative film. 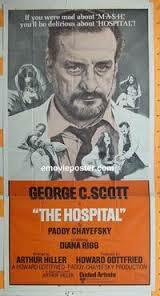 Instead of a television studio, this movie takes place in its entirety at a hospital. George C. Scott stars as Dr. Herbert Bock, and he’s the heart and soul of the movie. Bock is both the peter finch character and the William Holden character from network, rolled into one. That means that he’s both the guy who is frustrated with how ridiculous and stupid society has become, and also the older, tired guy who has an affair with a much younger woman, while analyzing both of their places in the grand scheme of life and clichéd circumstances. It hurts the movie to have Scott playing basically two characters, and really being one of the only stands out characters in the film. Network worked because it had a whole host of talented actors in powerful and iconic roles. But what helps the hospital is a strange mysterious angle to its plot. It all starts when one doctor is killed at the beginning of the film, and the events surrounding how he was killed are as cloudy as his death itself. The doctor was a womanizer who was always searching for an open bed at the hospital to take a woman to. When one older man died and was removed from the room, the doctor took advantage of this bed to sleep with a woman in. the next thing we know, it’s the morning and a nurse has found the doctor in the bed, dead. It seems like maybe the night time nurse thought the old man was still in the bed and gave that man’s medication to the doctor by mistake, not being able to see because it was night time and the lights were out. The doctor was asleep when the medication was administered. He was a diabetic, and the wrong medication might be what killed him. Only as the movie goes on, other factors start to come to the surface which begin to point to the fact that this might not have been a simple accident after all. Other characters start dying. One of them is another doctor. And like the first doctor, this second one is found on a gurney, dressed as a sick patient. While at this point it seems like a very strange and crazy coincidence, if it even is a coincidence at all, what stands out as funny is the fact that nobody noticed anything. Nobody noticed that there was a dead man lying there, surrounded by all of the excitement of the emergency room, or that the man lying there on the gurney was one of the hospital’s doctors. Another one. Herbert bock is the guy in the most disbelief about all this. He doesn’t know what to make of it, but can’t even fathom the incompetence of his staff. Aside from all of the dying that’s going on, there is also a strange Indian in one of the rooms. That’s because an older man who is in there for treatment believes in Indian prayer and is part of a tribe himself, and has asked this Indian to come in and do a ritual for him. The funny moment of all this is when the man in the next bed wakes up, sees the Indian, and assumes he is hallucinating. The older man, who has brought in the Indian, also has a young daughter, named Barbara. She is a feminist and a supporter of the Indian tribe and just as strong a female character as the Faye dunaway character in network was. And like the dunaway character, Barbara has a steamy affair with this much older man. It is unexpected and strange and suddenly gets bock out of his stupor and thinking about the rest of his life. For all of the ideas this movie has going for it, there are way too much of them that are preachy. This is a very smart and symbolic film with characters that use huge vocabulary words and analyze their places in the grand scheme of life. Network was like that too, but there was enough straight out violence or shocking moments mixed in that we were able to get past it. There were also a ton of characters. Here, everything is stripped to the bare basics. There is one male character, one female character, and a strange mystery going on around them. The mystery is what draws us in from the beginning. In fact, the start of the movie, where the doctor is found dead in the bed one morning and the characters race around trying to put the pieces together, is actually the high point of the film. From there, the movie gets kind of lost and caught up in character, leaving the mystery story behind to kind of work it’s way out in the background. At one point we get so far removed from the mystery that we wonder if it’s even still going or is ever going to be solved. The hospital is n interesting movie, but it is far from great. There is a good underlying story here, but so much could have been handled better. For one thing, Herbert bock needed someone else to talk to. Everyone other than Barbara, who he converses with, comes and goes with no permanence or real place in the movie. There needed to be a third main character, who were either bock’s good friend on staff, or else his assistant? You can see in this movie paddy Chayefsky’s potential to make something great. Clearly he is a guy who had something to say, and unfortunately the hospital struggles to get it out. Thankfully, for his next movie, network, Chayefsky worked out exactly what the problem was. Mainly not enough memorable characters. The hospital is okay, but it sure could have been a lot better. ng the deaths of these doctors are unknown, and as more starts to unfold, the reasons actually become cloudier. That’s one of the movies many mistakes. Instead of intensifying, the mystery actually starts to fizzle as it goes on. Still the premise is enjoyable and the humor is often there. Scott gives a great performance, and with just a few more characters, this could have been a much better film.